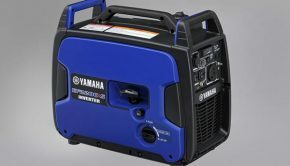 Yamaha assembled members of the media along with representatives from their dealers in Long Beach, California for the unveiling of their big September 1st announcement that they have been hyping up for the past couple of months. 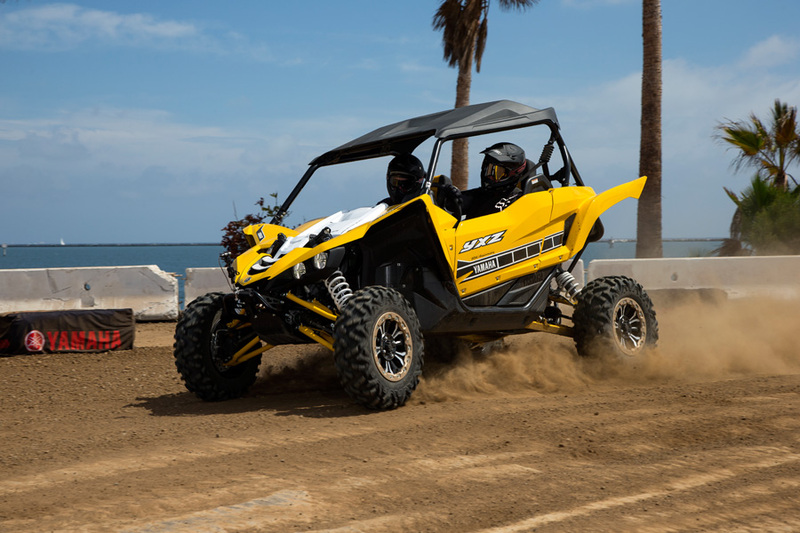 With leaked images of the YXZ1000R hitting the Internet leading up to the event, everyone knew why they were there; however, the new machine’s exact specifications, and more importantly, performance remained a mystery. Yamaha event staff did an outstanding job of keeping all the attendees in the dark regarding where and how the machine would be unveiled, adding to the excitement. The morning of the event began with a boat ride to a destination unknown. Leaving Long Beach, we cruised out past the Queen Mary enjoying views of the shipping ports, wild life, and people of the Long Beach Harbor and Pacific shoreline. 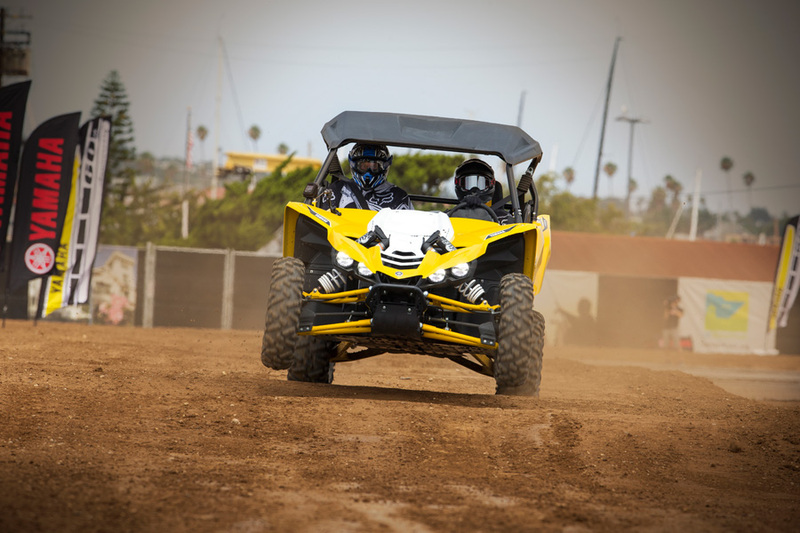 The journey ended at the Port of Los Angeles in San Pedro, the largest port in the US, where Yamaha had built a closed-course track to give all in attendance their first thrilling ride in the new YXZ. We arrived and settled in the grandstands within 10 minutes of Yamaha going live to the world with video of the machine’s launch that we were there to witness first hand. 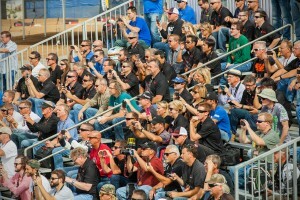 The entire roll-out was adrenaline charged, from the video, to the cars on the track. They even had fireballs making you feel like you were at a rock concert. 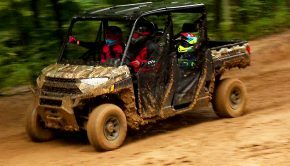 everyone was given ride-along opportunities in the YXZ1000R, piloted by Yamaha’s professional race drivers and product testing, t staff. The ride pace was blistering. With the world unveiling complete, the media and dealers rushed to the track to get their first view of the machine before heading off to a technical briefing. Next, everyone was given ride-along opportunities in the YXZ1000R, piloted by Yamaha’s professional race drivers, product testing, and product development staff. With lots of YXZR seat time under their belts already, the ride pace was blistering. The hard-packed track consisted of a number of turns, two tabletop jumps, and a long section of substantial whoops to challenge the YXZ’s suspension. The dealers in attendance were mostly all smiles when it came to the performance of the new YXZ although there were a couple who seemed to have a harder time dealing with the level of adrenaline brought about by the YXZ’s performance. 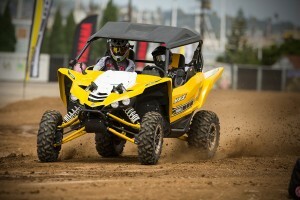 With the dealer rides out of the way, it was finally our turn to get a few laps in the YXZ and we weren’t disappointed. 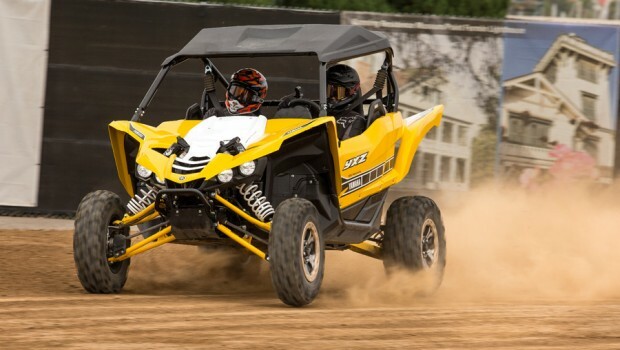 Based on our very brief time in the passenger seat, we’d have to say that the YXZ1000R is fast. The 998cc triple-cylinder engine seemed to run flawlessly throughout the RPM range. While low-end power remains a bit of a mystery, the engine produces a unique, crotch-rocket like sound, ripping throughout the midrange and top end. Breaking the back end loose for power-slides seemed rather easy and controllable with a broad power curve. Acceleration seemed impressive exiting turns, quickly getting up to speed for jumps. While we didn’t get to feel the shifting smoothness for ourselves, the one-down, four-up shifting pattern of the sequential transmission should make shifting easy and precise while hammering off-road. Breaking the back end loose for power-slides seemed rather easy and controllable with a broad power curve. Acceleration seemed impressive exiting turns, quickly getting up to speed. for jumps. 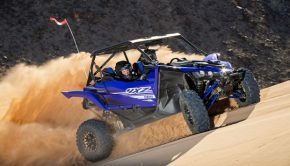 At 64” wide, with a 90.6” wheelbase and sway bars found at both ends, the YXZ cornered flat. From the seat, the tubular steel chassis felt rigid, with little flex, as you would want from a high-performance machine. The dual a-arm rear suspension sort of combines a traditional dual a-arm setup, with a multi-link design. The benefit is said to be improved rigidity over the competition, while preventing unwanted rear camber change throughout the suspension stroke. With dual a-arms up front, the car is equipped with fully adjustable Fox Podium 2.5 RC2 shocks at all four corners, delivering 16.2” of travel up front and 17” out back. The YXZ tracked straight each and every time it blitzed through the whoops. There was never any sign of swapping side to side or front to rear rocking. The car stayed flat, and the suspension kept the wheels tracking beautifully. Jump landings were plush from the couple feet of air the rolled jumps provided. The YXZ tracked straight each and every time it blitzed through the whoops. At 64” wide, with a 90.6” wheelbase and sway bars found at both ends, the YXZ cornered flat and predictably. 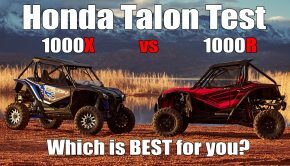 14” wheels are the standard in the 1000cc class, while the YXZ’s 27” Bighorn 2.0s are among the smallest reducing the tire’s sidewall height. This cuts down on unwanted tire roll in corners, undoubtedly adding to the car’s planted feeling in turns. While we didn’t get to feel the brake pedal, the dual hydraulic disc brakes at both ends clearly delivered a lot of stopping power, as our drivers pushed the limits of late braking heading into turns. Strong brakes, flat cornering, and the ripping, high-revving engine made the car feel right at home on the tight flat turns of the test track. Our initial impression of the cockpit and its details is very good. Our initial impression of the cockpit and its details is very good. The doors and their latches seemed well-built and offered good side coverage. The seats seemed comfy; the seat belts didn’t create any unwanted pressure points on our shoulders; and visibility out of the machine was as good as promised. You can seemingly see the ground right in front of the car, while the included sun roof shouldn’t hamper your view up the side of steepest dunes. Yamaha is making the bold claim that the YXZ1000R is the world’s first high-performance side-by side. While we’re pretty sure that there are a lot of Polaris, Arctic Cat, and Can-Am owners who would argue that statement, there aren’t a lot of motocross bikes, sport ATVs, road race bikes, or race cars that use automatic transmissions, so point taken. 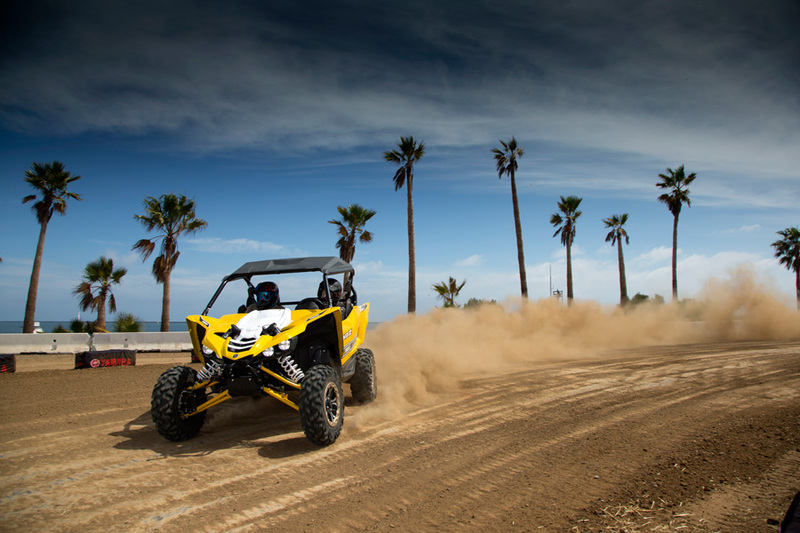 There is so much left to explore about the YXZ1000R’s engine, suspension, and handling. Other aspects such as its power steering performance, braking feel, and overall connection between driver and machine remains yet to be experienced at all. Still, based on our brief experience in the YXZ1000R, we can attest that it is definitely a ground breaking, high-performance side-by-side. With Yamaha’s reputation for durability, craftsmanship, and attention to detail, its competitors have a reason to sweat, while the rest of us continue to drool. We’ll be delivering full details and a complete ride review coming very soon. Meanwhile, visit yamahamotorsports.com for complete specifications, or to find your local Yamaha dealership to check out one for yourself.